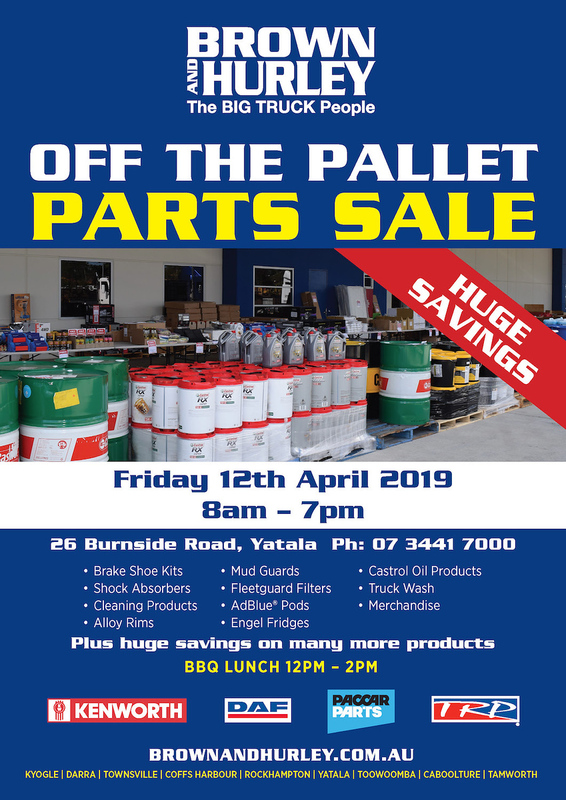 Brown & Hurley Yatala’s ‘Off the Pallet Parts Sale’ is on Friday 12th April 2019. Huge savings on a wide range of truck parts and accessories. Mark your calendars, Friday 12th April is Brown & Hurley Yatala’s ‘Off the Pallet Parts Sale’. On from 8am until 7pm, including a BBQ lunch 12pm until 2pm. There will be a huge range of parts, accessories and merchandise on sale, including Brake Shoe Kits, Shock Absorbers, Fleetguard Filters, Engel Fridges, AdBlue® Pods, truck wash and much more. Kenworth’s latest releases, the T360 and T410 will also be on display for your viewing.